California has lost its social mind. 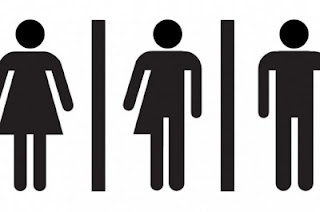 First it legalizes so-called "gay marriage" and even fights the people's vote saying no to it; now it has passed a law allowing 'Transgender children' to pick whatever bathroom, locker room or sports team they want to use. Governor Jerry Brown signed the bill into law which originated from assembly man Tom Ammiano. The bill AB1266 will take effect on Jan. 1, 2014. Many people are protesting this bill citing it to be dangerous. Any child can now claim he is a 'boy' or 'girl' when convenient. This will open the doors to many problems such as; sexual assaults and voyeurism. How can a young girl go to the bathroom or undress in a locker room with a guy present who thinks he is a girl? Moreover, boys will pretend to be girls just to get a peek at some naked girls! The same will occur with girls who will want to go to a boy's bathroom or locker room to see naked boys. Has the world gone mad?